The sky was such a beautiful color when I took these, and they are edited as little as possible to show the watery, pale colors as true as was captured on the camera. Stars were just starting to peek out as the sun went down and my pink house and the orange sunset sent a lovely warmth across the snow. Winter skies have such a mysterious, magical quality. 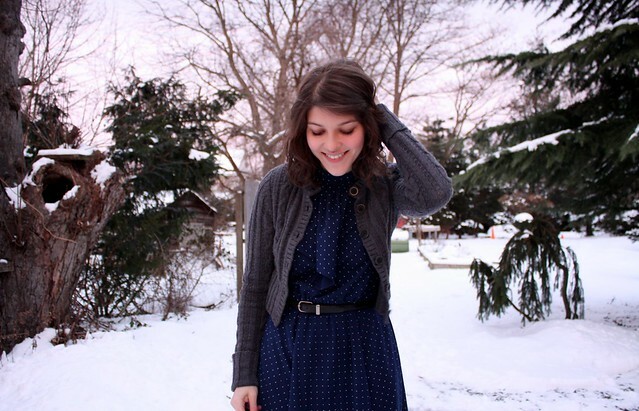 My favorite vintage dress reminds me of twinkling little stars scattered across midnight blue. I wore this on Thursday to work, and again on Saturday to run errands because it was so comfy and nice. Your dress is sooo cute! Love the outfit, especially the length of that cardi. Very funky. Pretty outfit. And you continue to do something I wish more fashion-bloggers would do -- vary poses and places. It makes your pictures visually interesting. It's a joy to see your new posts. I'm a sucker for any thing polk-a-dotted, and this dress is no exception. you're real pretty too, btw! aww love your dress, so cute!! That dress is lovely on you, and your hair looks wonderful! Oh my that dress is so darling! I love the color and the tie and how you paired the blue with black accessories. Dark blue & black are so Wintery together & I love it. The sky in the last photo is especially gorgeous! I agree with you about winter skies, they can be perfection. Unfortunately, the London sky has been steel grey and uncompromising the last several days. Your dress is lovely, and that outfit does indeed look perfectly comfy! your dress is vintage? it's darling! and the socks and boots look great with it. Great outfit :) The cropped cardi looks lovely with the dress and the white socks peeking out from your boots are a brilliant touch too! Kallie, you are really beautiful! 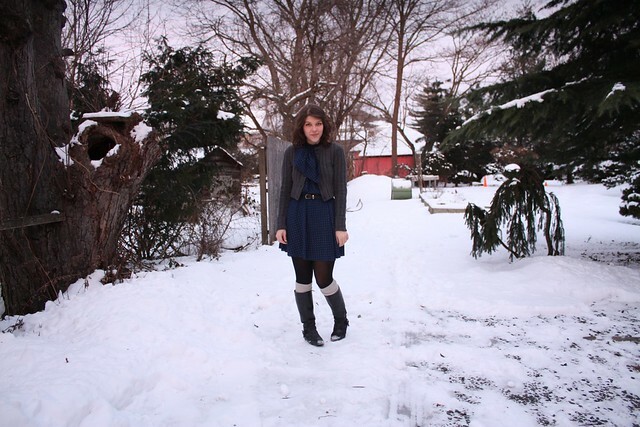 The dress suits you so much, and I always love leg warmers sticking out above boots :) How come you still have snow? I totally love your dress - I can't even put it properly into words but I love love love it! Very pretty look! and u r such an adorable girl! u have amazing smile! Lovely lovely, adorable outfit Kallie! And the pictures are amazing. I have a cardigan very similar to that, stole it from my sister haha. You look very pretty Kallie! Very sweet. I adore the dress and I am so jealous of your hair! It always looks perfect! love that dress, btw I'm hosting a $100 Shopbop giveaway on my blog! Come check it out! Ohhhhh my gosh, you own THE best dresses in the entire world! I'm so, so jealous. Lovely! Snow! Lucky you! In Sydney the weather is a continuous cycle of boiling, boiling, boiling! It really doesn't get any lovelier than this outfit. Love navy blue, what a classic, timeless colour. You look adorable. i love your dress!and your blog is very cute! Adorable! Love the polka dot dress - there's one at BCBG right now thats look similar! You are so cute! I love your hair!